I have Christmas cards on the brain, although I haven't ordered mine, or even picked out a picture for that matter. Here's one (by the wonderful Hailey Erickson that I don't think I'm using, although it delights me to no end. No, this photo is not doctored. My tiny man is truly that charming. One thing that always plagues me while addressing my Christmas cards is how to write names properly on the front for my friends with families. Is it too informal to address it to "The Smith Family?" 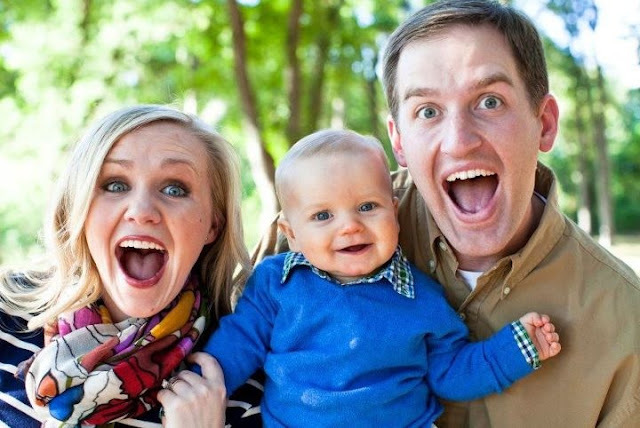 Should I say "Mr. and Mrs. Smith and Family" leaving their children anonymous? So many options, but which one is correct? So being that I'm thinking about this pre-card order, I thought I would look up the rules so there would be no more guessing. Here's a summary I grabbed via EmilyPost.com--another Emily I know that is always right. Ahem. If you have any other addressing relationships not listed below, most likely, they cover it there, with one major exception--the one thing I wanted to know. I would love to hear your thoughts on this. Bonus points with Internet citation. 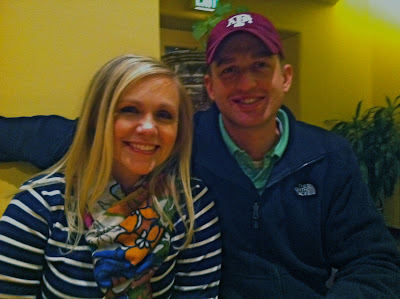 Before we celebrated Thanksgiving, Mr. G and I headed off to the great Southwest for a long weekend with 2 other couples from our church, the Brantleys and the Cooks, to celebrate Chris's 30th birthday. It was the first time we left our little guy overnight for more than 24 hours and further than 60 miles away. Also, I'm a Very Nervous Flier which will go down as one of the greatest ironies of my life. I never let it stop me from going anywhere though. Anywho, we arrived in ABQ Thursday evening and made the short drive into Santa Fe under the cover of darkness. There was a little movie premiere that night (Breaking Dawn, what of it?) which we bought tickets for um, like a month ago. Not gonna let a trip get in our way of seeing it! So after the boys were safely at the house, we headed into Santa Fe. The movie was gory, much more so than it played out in my head while reading the book. I did a lot of sleeping, reading (The Hunger Games), and Twilight movie watching, since it was on every station. It was so nice to sleep in! Sleep is so wonderful! I love sleep! Day 2 found us at Ten Thousand Waves, a spa built into a mountain (that is, after we saw Breaking Dawn for the second time. Oh yes, we did.) Let me tell you, it was faaaaaaabulous. One of my treatments was a head and neck massage where they treated my hair with this lavender hot oil conditioner. My hair was softer than it's ever been once I washed it out. By the time we left, I could've melted from the relaxation. Official book of Santa Fe Trip 2011. Another day we shopped around the square at Santa Fe. There is so much more to offer than just southwestern jewelry and Indian blankets. (My original expectations, my bad.) I found some cute Christmas decor at Doodlets, which is just across the way from the very delicious Cafe Pasqual's, and a fun toy for the boy at a toy store just around the corner. There's even a J.Crew. So there were a few Southwestern artifacts, such as this shrine to the Gloved One. By the third day, Mr. G and I were straight up missing our little guy. He's just so much fun right now. He has this hilarious little opinion about everything. I hope I never stop thinking it's funny. (Feel free to laugh at my naivete. I do.) My mom told me he was saying "mama" while we were gone, but he has yet to say it to my face, so I'm not too convinced. We stayed in a great house (found here) just outside of town, with heated floors (come to mama! ), and lots of comfy couches and chairs to nap or read in. The gentlemen golfed, and we all met up to eat out a lot, laugh a lot, and just relax. So refreshing--exactly what a getaway should be. Our Thanksgiving was just lovely. We ran down to my hometown for the holiday. It is wonderful to be so close! Everyone was kind of in and out throughout the weekend going to jobs, in-laws, football games, hunting, shopping, etc. I love my family. I am so, so thankful for each and every one of them. God has been so gracious to me in the area of family. Having one that plays well together and argues well together (because there is a right way and a wrong way, you know) is a blessing that is often overlooked. This year I was especially thankful for our sweet boy. He is just the best! 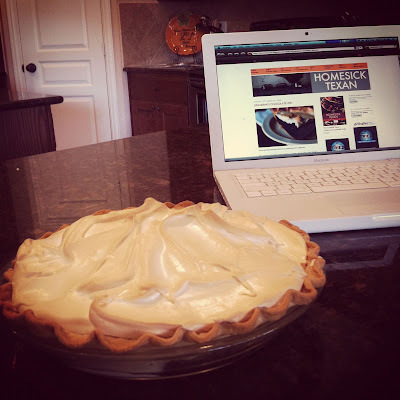 I made a chocolate pie for Thanksgiving, then left it at our house because Thanksgiving morning was a bit chaotic*. I made the Pioneer Woman's rolls for Thanksgiving lunch at my Grannie's. I promise you that Homesick Texan's Grandma's chocolate pie tastes just like my Meemaw's chocolate pie (which I don't have the recipe written down.) I mean, maybe our grandmothers were cousins and learned from the same grandma. It's that similar. 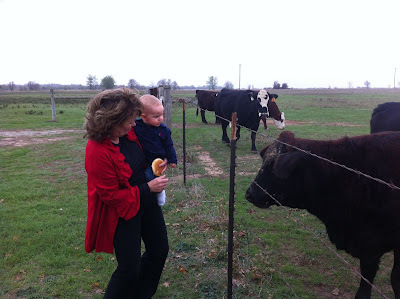 On Thanksgiving Day, Jack, Sugar, and Grannie (his great-grandma) fed the cows hamburger buns. If I were a cow, I would be totally offended. I have several hairstyles pinned on Pinterest, but all of them require my mama to make them happen. I can't French braid my own hair in less than 3 hours. So I asked and begged and pleaded that she watch YouTube videos and put my hair up. She gave in pretty easily. This was my favorite. Yay, Mom! *I can't pack as quickly with a tiny man scooting about. We left 30 minutes late, and my hair was NOT done. We will not even discuss the smoke billowing through my parents' house as the rolls burned while I did my hair after we arrived. Being on vacation has knocked me off my game. I've jetted off to beautiful Orlando, FL for my very fabulous job, however I would not know if Orlando was beautiful this trip or not since I've been locked away in conference sessions. The past few months have seen me investing mostly in comfortable, flat mom shoes. As I've become more confident in my role as outside-of-the-home-working-mother (or whatever such label-nonsense society might place on me) the height of my heel has gone up. I'm figuring out that I can slip into flats on the way to get my baby or into heels as I climb back into my corporate role. This heel height discovery might be symbolic in some way to my self-discovery and what not, etc., but really this post was to tell you about the fabulous heels above. 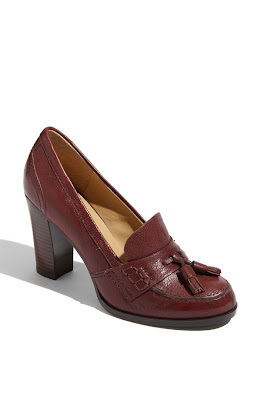 They are my conference footwear of choice this week, currently on sale at Nordstrom. The wide but not clunky heel provides comfort, and the height provides some sassiness. The loafer style with tassels are completely in step with this year's runway obsession of men's-styled wear. I've been wearing them 3 full days with no terrible foot pain. The pic above is a little deceiving as the heel height is 3 1/4 in. In short, I highly recommend. The only reasonable explanations I have for this phenomenon are that 1. I have finally caught on to this 2004 technology called "DVR" and 2. I am busy rocking or feeding the baby and putting him to bed around 8, at which point it is too late to do any housework (at least, that's my story) and too early to go to bed. So bring on TV! 1. Parks and Recreation: This is hands down the funniest show on major network television right now. Every single character is hilarious. If you've never seen it, I'm going to need you to tell me why in the comments. You will find B and I rolling over it every Thursday night. 2. Revenge: I find myself strangely drawn to Revenge primarily because of Emily Van Camp's hair. It is simply beautiful, as is the gorgeous set where they are filming. Also, I can't wait to see how the whole "revenge" thing is resolved. There can't possibly be any winners at the end of the series. 3. Person of Interest: I'm watching this one with B also. As much as I didn't like Ben in LOST, I really like Michael Emerson in POI, and he seems like almost the same character! (For good, not evil though.) That being said, the show has a great premise, but we think it would do better on a Monday or Tuesday night rather than Thursday. If you've not watched it, each episode is a story unto its own, so you can jump right in at any time. 4. Once Upon a Time: I really wanted to dislike this show. I'm not a big fan of at least one of the actors in the show, and the premise reminded me too much of Enchanted. Honestly, I would not be able to handle that amount of sweetness as a series. That being said, I watched two hours of this and loved it. If you like fairy tales, I think you would like it too. What's filling up your DVR that I should be watching? So there I was, leaving the baby for the first time to watch the Rangers lose the World Series. My dad texted me around noon last Tuesday, asking me what the odds were we could fly standby from Dallas to St. Louis to watch the Rangers win Game 6. First I laughed and ignored his text message. Then I actually looked up the flights and was all, "You're not going without me!" Unfortunately, my man had other commitments, but my brother was available to go too. And then my mom (a 1st grade teacher) was all, "The three of you aren't going without me!" About 5 hours lapsed from decision time to go time. I left the office, ran home and packed a bag, ran across the street and smooched on my baby, then ran by Academy to buy some blue Ranger gear. We wanted to stand out in that sea of Cardinals Red. Back to Dallas I went. Fountain dyed red to support the home team. We took the Company Plane up north and waited out the rain delay. (There wasn't much rain to speak of.) During the delay, we shopped, ate, and did a little exploring in STL. My dad complained that I wanted to go to the mall on rain out night, but while we were there, we ran into this guy, and I do believe we were outside of Sephora. This is the most terrible pic of me to date, but it was Elvis Andrus, only hours before the Rangers lost the World Series. We did not go up in the Arch while we were there. We did eat Imo's Pizza, and it was good. We also ate crepes at a place called Rooster, which I recommend. We stayed at the airport Hilton, which I also recommend. We took the MetroLink the entire time, rather than renting a car. I paid $10 for hot chocolate during the game. It was worth it. They have a beautiful new Nordstrom in their Galleria. Drew had something else going on Thursday night and didn't get to stay for the game. Boo. I would go back to STL for a long weekend and do more exploring, but I think it would need to include a sporting event to have enough to do. It was the trip of a lifetime! As we got down to one strike left (twice), I will never forget how the cameras starting flashing all around the stadium, just like you've seen before on TV. I'm so glad I got to experience it with my dad, the one who taught me to love baseball and love the Rangers. More than anything, it was incredibly gratifying the entire week to see him having so much fun. And one of these days, the Rangers are going to win it. My tiny man on our front porch hamming it up, sans mustache. the same place next year? I found his costume on a Mexican import website. Who knew they made toddler panchos and sombreros? B grabbed a mustache on his way home from work last Friday before our church's Fall Festival (and the Rangers final meltdown of the year.) It only seemed natural to stick it on his favorite paci, and shockingly, he had no problem with either it or the sombrero on his head. We had such a fun Halloween! This was the first time we've actually stayed in our home of 4 years and passed out candy to the neighborhood kids. I know, I know, but in our defense, it's because we usually were either out of town or with friends. We had my BFF/college roommate (hi Alisia!) and her friend Brian over for supper, which ended up being Frito pie and chili dogs. Halloween seems like a Frito pie holiday, does it not? My mom informs me that I feel this way because she always fed us that before we went out trick or treating when we were little. Funny how things like that influence in adulthood. Anyway! I had so much fun handing out candy. Jack fell asleep super early in Alisia's arms and not even the doorbell could wake him up. Some of the cutest kids and very few of questionable age to be trick or treating. How old is too old to do that anyway? And how young is old enough? Even if the boy is old enough to eat candy next year, obviously he doesn't need a whole bag of candy otherwise it will be clear that he's shilling for mommy's chocolate fix.